Leading halyards aft is becoming quite popular on newer boats today. Leading the lines to the cockpit can provide the convenience of not having to leave the safety cockpit in order to control the sails. This comes at the cost of added friction, even when using extremely high end hardware to try and reduce this. Let us take a look at some of the pro’s and con’s regarding leaving them at the mast, vs. leading them aft……. 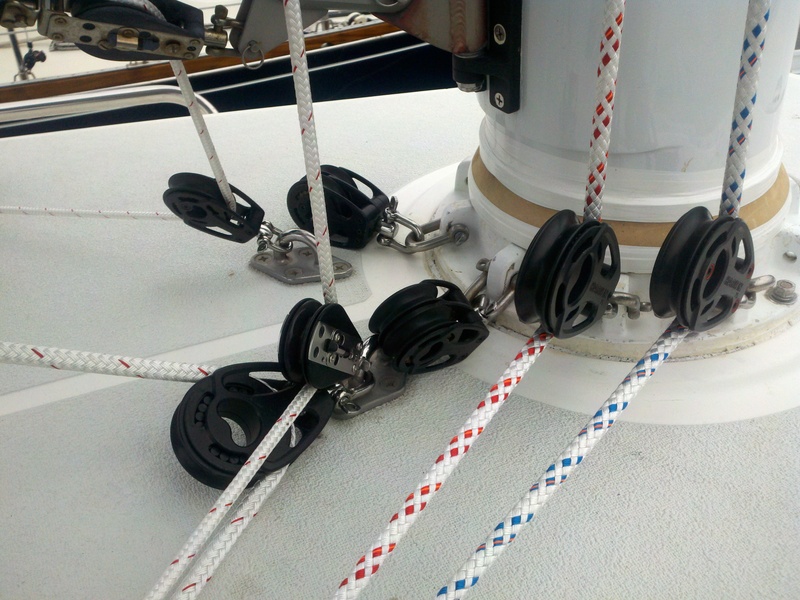 A good way to set up a blue water cruiser is to leave all halyards at the mast via two winches, one for each side, and to have two horn cleats beneath them, either as a back-up or as a dedicated halyard cleat. With this type of set up all lines are run to rope clutch banks, allowing for lines to be cleated before the winch and keeping the winch free at all times. Keeping the halyards at the mast will ensure reduced friction when hoisting or dousing (this reason alone is why I would want to leave everything at the mast). Problems are also easily diagnosed from the mast. This can be helpful especially when offshore in a non-ideal sea state via a good, solid safety or winch service railing (pictured below). Aside form the obvious reason of reduced friction and diagnostics, most boats these days are at least equipped with headsail furlers if not, behind the mast, or in-mast furlers for the mainsail. There would be little reason to have access to halyards associated with vertically furling sails back aft in the cockpit. Instead you should just make sure that your furling lines are cleanly led and that the furlers are fully operational before a big trip. Having said that, let’s now address some of the pros associated with leading halyards aft. There are some cases where it does make sense to lead the ‘mainsail gear’ aft, especially in the case of the conventional or horizontally furling mainsail (or boom furler). In this case, time should be taken to ensure that it is done properly. Taking shortcuts here and leading these lines aft improperly is more trouble than it is worth and can lead to safety issues. The ‘mainsail gear’ that I speak of is typically comprised of; the main halyard, the reef lines (or furling line), and the boom’s topping lift. In order to have the main halyard run aft, it needs to be accompanied by all of these lines. 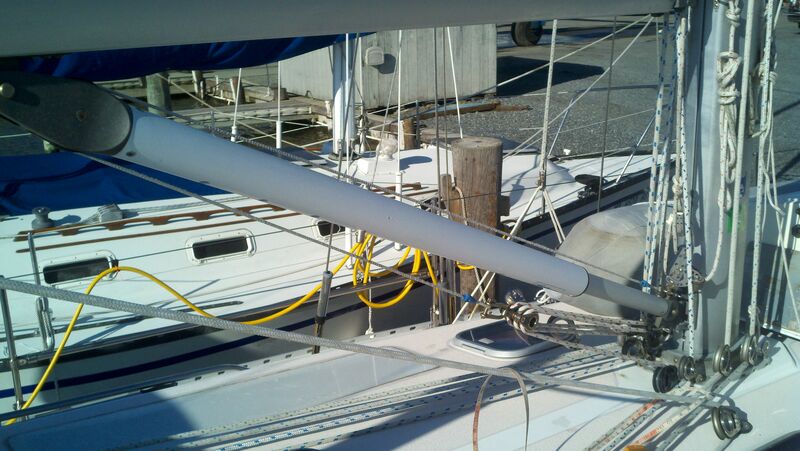 This is because, the main halyard is dependent upon the boom topping lift (unless a rigid vang is present) and the reef lines for full functionality. When leading the reef lines aft they should be configured either as single line reefs or in-board/ out-board reefs. If you don’t take the time to ensure that this is done correctly (which I have seen all too many times) you can find yourself doing the ‘mast-to-cockpit dance’ in order to reef, douse, or hoist, which can be unsafe and dangerous, especially in typical reefing conditions. A halyards aft system is totally suitable and appropriate to the right type of boat and the right individual, as long as it is set up properly. 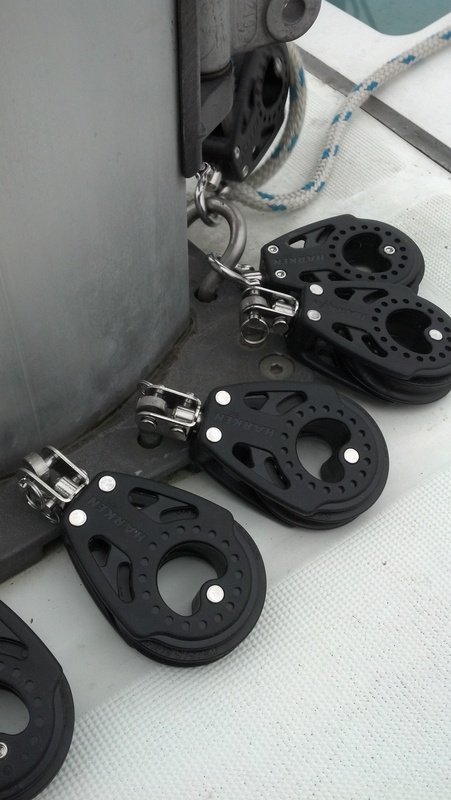 If you have, or are thinking about having, your halyards run aft, see your local rigger and discuss with them if your boat is set up correctly or what the best setup might be for you and your boat. What is it called – the ring around the mast base that allows direct attachment of blocks? Either a mast collar or a mast step, depending on whether or not the mast is keel stepped or deck stepped. Some, not all of these, offer block attachment points. I do believe that Catalina Direct offer something called a halyard plate which can mounted in conjunction with their mast step to allow blocks to be hung. Thanks for the kind words, but I cannot remember which article that might be. Perhaps one of our <a href=”https://theriggingco.com/2016/12/05/views-from-aloft-27/”>views from aloft </a>. Feel free to call the office to discuss 443-847-1004.